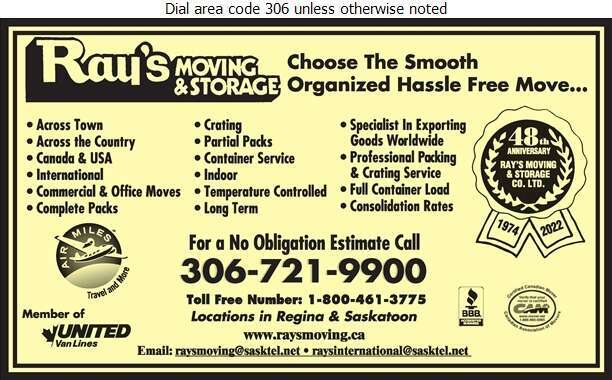 Ray's Moving & Storage Co. has been serving Saskatchewan since 1974, with offices located in Regina and Saskatoon. We understand that moving can be a stressful and taxing time for a family, not only physically, but psychologically as well. Let us take the headaches away by allowing our experienced packers to efficiently pack and crate your possessions, so you don't have to. Whether you are moving across town, across the country or across the world, Ray's Moving & Storage can assist you. Our qualified packing team handles your belongings with care and expertise to safeguard against breakage. At Ray's, our experienced movers have the knowledge and skills to make your move a pleasant experience. Choose the smooth, organized, hassle free move; choose Ray's Moving & Storage.